It isn’t hope that I cling to, but Christ, Who is our hope. This scene from the Lord of the Rings trilogy is one of my favorites. We all can identify with being so overcome with troubles that we just don’t have any fight left. But somewhere down deep there is a motivation to keep fighting – underneath all the mental warfare going on – it is hope. But not just hope for an outcome – hope in the goodness of God and that good will prevail. Last week I was asked how I cling to hope when going through really hard times. 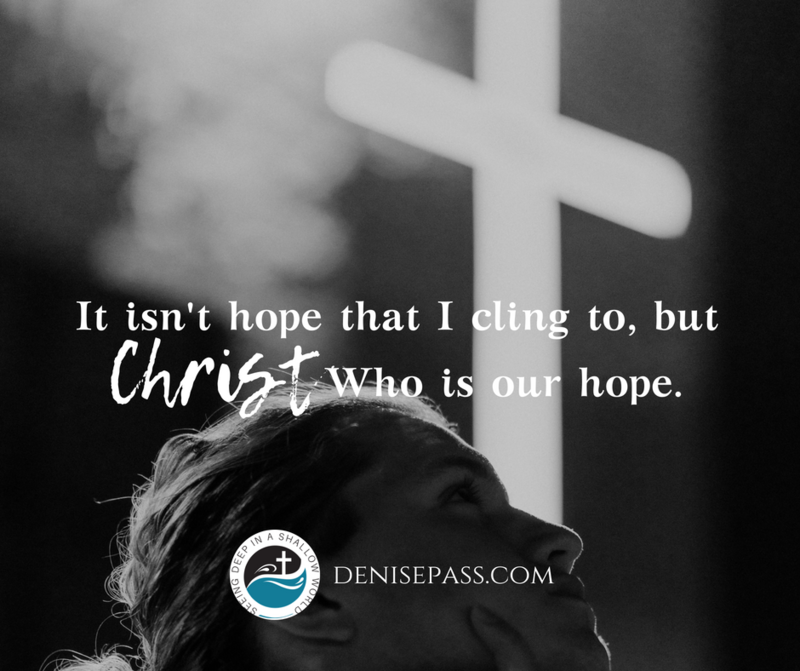 In that moment, all the lessons the LORD showed me through the Hope Reinvented message congealed once again with this singular truth – it isn’t hope that I cling to, no, it is Christ, Who is our hope. It isn’t hope that I cling to, no, it is Christ, Who is our hope. This real hope is not offered to the casual observer. It is found in the deep places, where many would rather not trod. But is the life free of troubles a worthy pursuit? Is it worth missing knowing this incredible hope we have and are called to? And there is a mystery in this hope. Just when we think we cannot hold on for one more second, we discover that this hope is within us – holding us up. It is not something we must reach for on the outside. It is living inside of us as Christ dwells in our hearts. Like the runner’s high that does not happen in the first leg of the race, suddenly we recognize an inner strength that was carrying us the whole time. Hope carries us even as we search for it. When we feel we do not have any fight, we can remember the reason we fight. We don’t fight for hope itself, but for the Author of hope. This is a higher motivation than just our pleasure but we also know our great God has a hope for us that far surpasses any temporary sorrow this world sends our way. Hope’s fight isn’t just for happiness or to return to what we knew. It isn’t just for the troubles to cease. Hope understands that such times will pass. Hope’s fight is to see God glorified in our struggles so others may also know that our God is enough. Hope’s fight is to rise above our circumstances and live with an eternal mindset. Hope’s fight is not to become fixated on our problems, but on Christ, our hope. Hope’s fight is to recognize God’s sovereignty and goodness in the midst. And hope’s fight is to cling to Christ and know Him more through it all. What are you holding onto today? Have you lost your fight? God sees you, friend. Search His Word. Look within to the indwelling Holy Spirit. God has revealed Himself through Christ, our Hope. When life simply hurts, we find our refuge in Him. Don’t get sidetracked and distracted by life’s hiccups and sorrows. Get up and keep fighting the good fight – God glorified in all of our glorious messes down here. Our hope is real and will one day soon be revealed and realized fully.